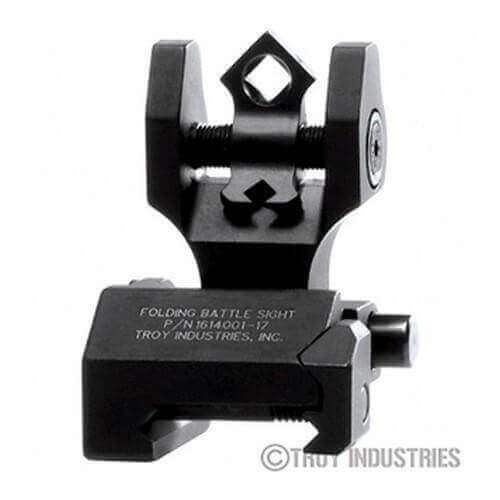 Advanced design, superior sighting and battle-ready toughness define Troy Industries’ Di-Optic Aperture (DOA) Folding Rear BattleSight. Recently purchased my second set of Troy BUIS with Dioptic Aperture and Tritium. I’m old enough to have used iron peep sights in my high school days on the rifle team and am very familiar with the accuracy that this style sight is capable of delivering. The Dioptic rear aperture makes precisely centering the front sight post very easy and the tritium inserts extend the usability of these sights into conditions of failing daylight well beyond those sights without this feature. Buy once, cry once, own the best. Ordered these with a lil concern about the counterfeit issues going on in the AR15 marketplace. But they came in genuine. And when I went to the range, they were practically zeroed in at 50 yards. That was kinda neat. Very sturdy, very minimal. Easy to acquire di optic on both 100-300 and 300-600. I would highly recommend this product to anyone. This is an Exellent sight and AT3 Tactical has as good a price as anyone with exceptional service.